If you want pictures of your cat or kitten to be featured on our website and Facebook Page, please read the steps below. 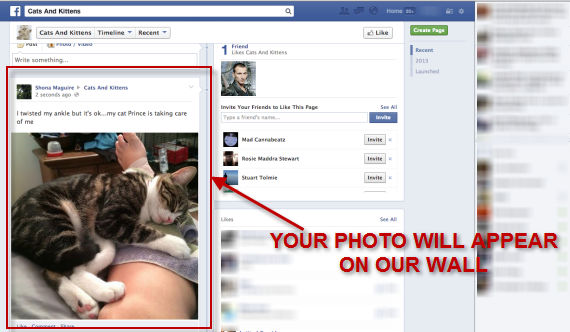 This is the only way to submit your pictures to us for posting on the site and Facebook Page. (Note: If you’re a website owner, blogger, photographer or YouTuber (or if you make a product for cats or cat owners) and think you have something that our audience will love then please submit via the ‘Contribute’ page here. Step 1: Make sure you like our Facebook Page. Step 2: Make sure you know where your photos are stored on your computer. 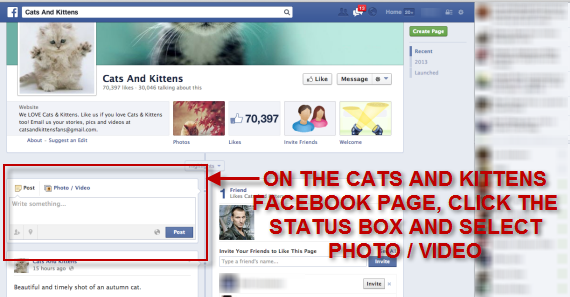 Step 3: When logged in to your Facebook Profile, go to the ‘We Love Cats and Kittens’ Facebook Page (as opposed to just seeing our posts in your News Feed’). Step 4: Whilst on the ‘We Love Cats and Kittens’ Facebook Page, click the box for a Status Update, then select ‘Photo / Video’ and then click ‘Upload Photos/Video’. 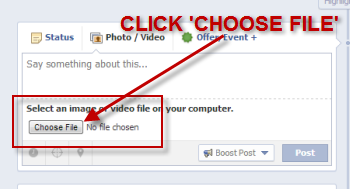 Step 5: Just as you would when posting a picture to your own Facebook profile, click ‘Choose file’ and then navigate to the folder on your computer where the photo is stored. Click on the photo in your folder and it will be added to your Facebook post on our wall ready to upload. Step 6: Type in something about your picture and about your cat or kitten and click ‘Post’. You will see the post and your photo appear on our wall. This is where people often get confused. If you refresh our Facebook Page (or go back to your profile and then come back to our Page) you will usually see your post and picture disappear. Normally you won’t see it on your profile either. DON’T Worry. It’s still there but if you don’t know where to look it is confusing! Step 7: Check that your photo is on our wall by clicking ‘Highlights’ on OUR Facebook Page, which is in the centre of the page. This will reveal the option ‘Posts By Others’. Scroll down and click that. Step 8: You should see your post and photo on that ‘Posts By Others’ area of our Facebook Page. This is where you’ll need to look if you want to delete it or to be sure it has been posted to our page. Step 9: Daily, we choose the best photos of your cats posted to our page in this way and post them to the website and the main section of our Facebook Page. Thanks for taking the time to post pictures of your cats and kittens to our Facebook Page – we can’t wait to see them and share them with all our followers.